"These muffins are made with bran cereal, and sweetened with pineapple juice, brown sugar, and honey. The recipe requires the batter to be refrigerated for at least 3 hours. It can be made the night before, and then baked in the morning. Makes 20 regular muffins, or 12 jumbo muffins." In a small bowl, combine pineapple juice and raisins. Set aside. In a medium bowl, combine flour, baking soda and salt. Stir in cereal. Set aside. In a large mixing bowl, combine brown sugar, oil, honey, and eggs; mix well. Add cereal mixture, and mix well. Fold in the raisin mixture. Batter will be thin; it will thicken as it chills. Cover, and refrigerate for at least 3 hours or overnight. Stir chilled batter. Fill greased or paper lined muffin cups 3/4 full. Bake in a preheated 400 degree F (205 degree C) oven, for 20 to 25 minutes. Cool in pan 10 minutes before removing to a wire rack. A very heavy muffin! It's a little to heavy for me, but you could actually eat it for breakfast on its own and it would fill you up. I've used egg beaters to replace the eggs; have added up to 1 c. shredded carrots as well - both with excellent results! Cinnamon, nutmeg and allspice are also excellent additions. 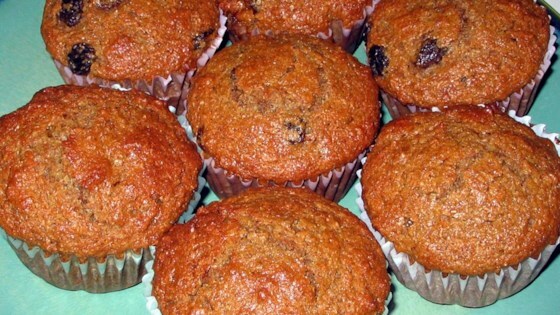 Great bran muffins! They were not too heavy and very moist. I also used apple juice instead of pineapple. Nice recipe.